I enjoyed myself at Victory Centre of Park Forest. They showed me a one-bedroom, but I was looking for a two-bedroom. I had a great time. The room was like a nice apartment with a bedroom and a dining room. They had a laundry room, library, and a gathering room. The best way to get to know a community is by scheduling a tour. See the facilities, meet the staff and residents, and get a feel first hand what it's like to live at Victory Centre of Park Forest Assisted Living. Centrally located in the heart of one of the most livable suburbs in the Chicago Southland, Victory Centre of Park Forest is a residential living community for Illinois seniors. Our convenient downtown location is just minutes from parks, shopping centers and two major hospitals, as well as numerous other destinations. Victory Centre of Park Forest is a Pathway Senior Living community. Founded in 1997, Pathway is a Chicago-based company in the business of improving the lives of older adults by providing them with affordable, life-enriching places to live. Our private studio apartments are spacious, with ample living and storage space. They feature in-suite climate control, kitchenettes and emergency call systems in both the bedroom and bathroom for added safety and security. Our shared companion apartments feature all the same great amenities as our other homes in a unique floor plan that maximizes privacy. At Victory Centre of Park Forest, we strive to create a sense of community among our residents through our robust activity program. Planned by seniors for seniors, our activity calendar is full of fun and exciting events such as cooking classes, live entertainment, movie nights and more. For seniors who are no longer able to live alone safely, our Supportive Living program is available to help. Currently only available in the state of Illinois, Supportive Living is similar to assisted living in that it offers assistance with activities of daily living, including personal care, meal service, medication management and housekeeping. However, unlike typical assisted living programs, communities that offer supportive living are able to provide financial assistance to residents if and when their personal finances are depleted. In addition, our all-inclusive service package provides residents with weekly trash removal, linen changing, laundry service, scheduled transportation, complimentary parking, and building maintenance and landscaping. Our staff are on site 24 hours a day to support our residents with daily assurance checks, move-in coordination, wellness checks, coordination of medical services and more. 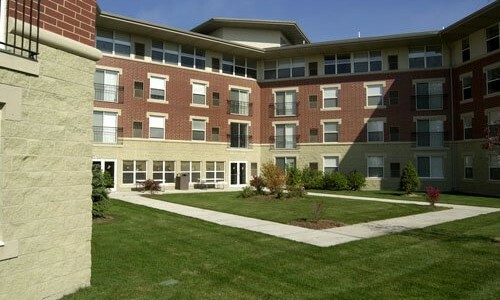 Independent Senior Apartments are also available for adults 62 and over on our campus. Enjoy senior living at its finest at Victory Centre of Park Forest!